Furnished to provide a light and airy feel, all the guestrooms at Kombo Beach are fully air-conditioned, no more than 65 metres from the beach and come with a good-sized private balcony or patio – perfect for soaking up those extra rays of warm Gambian sunshine. We endeavour to undertake refurbishments each summer, and during 2016 all our Superior Rooms received an update and enlargement, now offering 3sqm more bedroom space than before, plus a larger balcony. Bathrooms have also been completely refitted within our Superior Rooms (along with some Premium Rooms and Studios), and we’ve converted several Standard Rooms into Premium Rooms, as these are our most popular room type. New mod-cons such as LED TVs are now also available, and all our room types come equipped with hair dryers, fridges and safes (deposit required for Standard Rooms). All rooms are non-smoking. Studios are located on the ground floor with a view of our tennis courts. Ocean View Suites are located on the first and second (top) floors. Superior rooms are on the first floor. Premium rooms are on the ground floor. Standard rooms are mostly located on the second floor, with limited numbers on the first and ground floors. The rooms are surrounded by lush, tropical gardens, home to many birds. 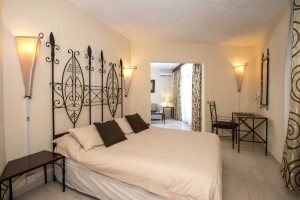 We offer double and twin-bed rooms and most of our standard rooms and all of our Superior, Premium, Suites and Studios are furnished with a sofa bed. To make families welcome in the hotel we have some connecting rooms; our Studios are ideal for families as they can accommodate up to four adults. 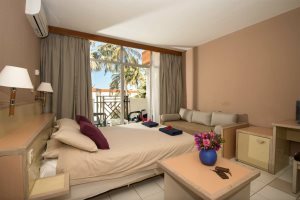 All rooms have safes (free of charge for superior, premium, studios and suites), are non-smoking (but each room has a balcony or terrace) and we provide free sun beds, mattresses and pool towels. There is a free Wi-Fi zone in the hotel reception, the Kudula restaurant and around the pool; in the rooms there is Wi-Fi, available at a small surcharge. 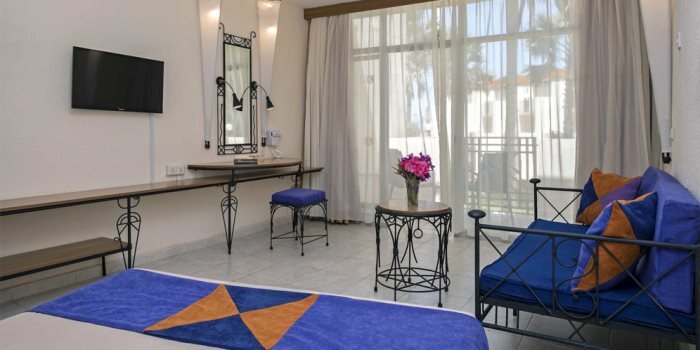 And last but not least, all rooms are within 65 meters from our beautiful sandy beach, and the Atlantic Ocean. Please note that some of our partner tour operators offer our standard rooms as non-air conditioned, in which case you can upgrade to an air-conditioned room upon arrival or during your stay. Mainly found on the second floor, all our Standard rooms have either a balcony or a terrace, sleeping up to three guests. 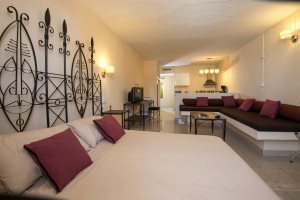 Located on the first floor, Superior Rooms benefit from a large floor space plus a larger private balcony. Located on the ground floor, Premium Rooms are large in size, and include a spacious patio with deck chairs. An ideal option for families, these extra-large, open-plan ground floor rooms offer a kitchenette including a fridge, microwave and coffee-maker. Boasting enviable sea views and a massive floor space, Suites are located on the first and second floors and are the best rooms from which to watch the sun set or rise.